Why do you think a specific piece was chosen? Would you have chosen it? Why or why not? Choose a story that made you feel a particular way. Explain this feeling, and then explain what in the text contributed to that impression. What can you gather about the authors included in the issue? What do you think it means for a creative work to have a strong sense of place? What do you see as the advantages and challenges of curating a magazine with a defined sensibility or theme? What is the effect of having such a defined theme? Do you believe the magazine is succeeding in its mission? How do you imagine finding the audience for this magazine? How do you see this magazine fitting into the broader literary landscape? If you became editor of The Common tomorrow, what is one thing you would change? How do the website and print publication relate to each other? What do they offer that is different? Similar? What is the effect of the digital pieces versus the print pieces? Write a sample review of an issue of The Common for a website or newspaper. Think about the questions above. 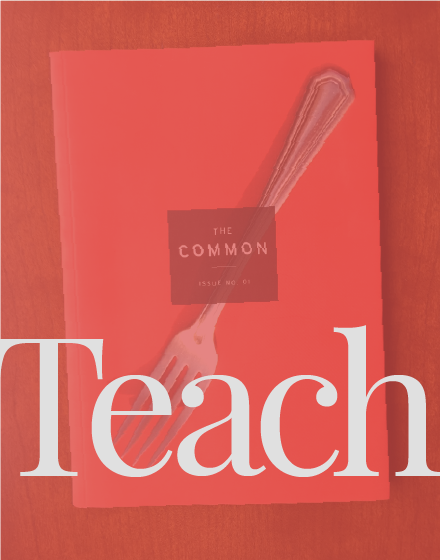 Help your reader understand what The Common is, and what they might find if they pick up an issue. Consider aspects of the journal (or particular works) that you find to be particularly strong. Consider what might be improved. Draft an acceptance letter, in which you describe what you like about the work, as well as what aspects you would like them to consider changing. Draft a rejection letter, identifying any areas of the work you find to be successful, and describing in what ways the work might be improved. Invite the author to send future work for consideration.